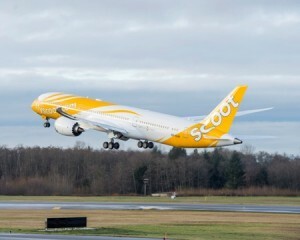 Boeing and Scoot Pte Ltd. today announced the delivery of the Singapore-based airline’s first 787 Dreamliner. The airplane will play a key role in the low-cost carrier’s strategic plan to expand its long-haul fleet. The 787 is a family of technologically advanced, super-efficient airplanes with new passenger-pleasing features. In addition to bringing big-jet ranges to midsize airplanes, the 787 will provide Scoot with unrivaled fuel efficiency and environmental performance, using 20 percent less fuel and with 20 percent fewer emissions than the airplanes it replaces. Customers traveling on Scoot’s new 787 will experience the passenger-pleasing features of the Dreamliner such as larger, electronically dimmable windows and larger overhead luggage bins. The lower cabin altitude, higher humidity levels, advanced air filtration and smoother-ride technology, help make the flying experience more comfortable and allow passengers to arrive at their destination more refreshed. The airline will take delivery of an additional 19 787 Dreamliners. The airplanes were originally ordered by parent company Singapore Airlines, which included ten 787-9 and ten 787-8s.